Tottenham has over 2.5 goals in their last 8 games in Premier League. Tottenham has over 2.5 goals in their last 3 home games in Premier League. Liverpool won their last 6 games in Premier League. Liverpool won their last 5 away games in Premier League. Liverpool scored in last 5 away games in Premier League. Leicester City has over 2.5 goals in their last 3 games in Premier League. Leicester City has over 2.5 goals in their last 4 away games in Premier League. Leicester City scored in last 8 games in Premier League. Leicester City scored in last 9 away games in Premier League. Bournemouth scored in last 4 home games in Premier League. Chelsea won their last 4 games in Premier League. Chelsea scored in last 4 games in Premier League. Chelsea scored over 1.5 goals in last 4 games in Premier League. Arsenal has over 2.5 goals in their last 3 games in Premier League. Newcastle United lost their last 4 home games in Premier League. Arsenal scored in last 4 away games in Premier League. Arsenal scored in last 3 games in Premier League. Arsenal scored over 1.5 goals in last 3 games in Premier League. Huddersfield Town has under 2.5 goals in their last 3 games in Premier League. Crystal Palace scored in last 17 away games in Premier League. Bayern Munich has over 2.5 goals in their last 3 home games in Bundesliga. RB Leipzig scored in last 3 home games in Bundesliga. Bayern Munich won their last 10 games in Bundesliga. Bayern Munich won their last 4 home games in Bundesliga. Bayern Munich scored in last 7 home games in Bundesliga. Mainz 05 has under 2.5 goals in their last 4 home games in Bundesliga. Mainz 05 has under 2.5 goals in their last 3 games in Bundesliga. FC Augsburg won their last 3 away games in Bundesliga. FC Augsburg scored in last 3 games in Bundesliga. FC Augsburg scored in last 5 away games in Bundesliga. Napoli has over 2.5 goals in their last 6 games in Serie A.
Napoli won their last 4 home games in Serie A.
Napoli scored in last 4 home games in Serie A.
Napoli scored over 1.5 goals in last 4 home games in Serie A.
Caen has under 2.5 goals in their last 3 games in Ligue 1. Lyon has under 2.5 goals in their last 6 games in Ligue 1. Lyon has under 2.5 goals in their last 3 away games in Ligue 1. Caen scored in last 3 games in Ligue 1. Lyon allowed opponents to score over 1.5 goals in last 3 away games in Ligue 1. Amiens SC scored in last 6 home games in Ligue 1. Lille allowed opponents to score over 1.5 goals in last 5 games in Ligue 1. Angers lost their last 4 away games in Ligue 1. Preston North End has over 2.5 goals in their last 7 home games in Championship. Preston North End scored in last 7 home games in Championship. Preston North End scored over 1.5 goals in last 7 home games in Championship. Millwall has over 2.5 goals in their last 3 home games in Championship. Leeds United has over 2.5 goals in their last 4 away games in Championship. Millwall scored in last 3 home games in Championship. Leeds United scored in last 9 away games in Championship. Leeds United scored over 1.5 goals in last 4 away games in Championship. Blackburn Rovers scored in last 3 home games in Championship. Blackburn Rovers scored in last 7 games in Championship. Barnsley has over 2.5 goals in their last 4 away games in League One. Barnsley scored in last 8 away games in League One. Barnsley scored in last 4 games in League One. 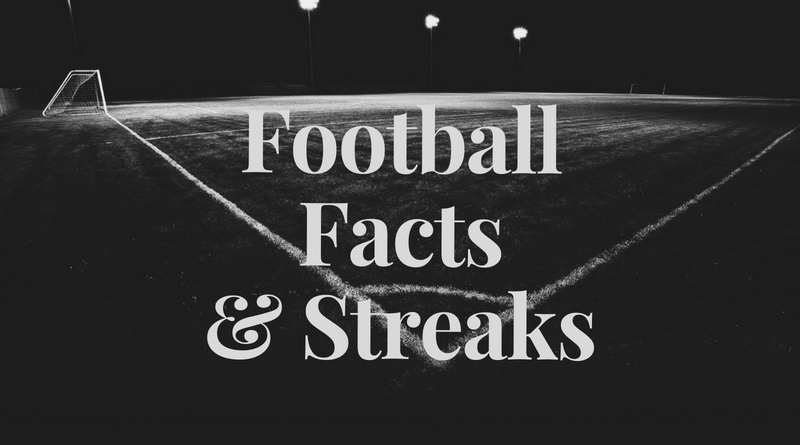 Coventry City allowed opponents to score over 1.5 goals in last 3 games in League One. Barnsley allowed opponents to score over 1.5 goals in last 5 games in League One. Fleetwood Town has over 2.5 goals in their last 3 home games in League One. Accrington Stanley has under 2.5 goals in their last 3 games in League One. Accrington Stanley ended draw their last 3 games in League One. Accrington Stanley scored in last 8 games in League One. Accrington Stanley scored in last 14 away games in League One. Ajax has over 2.5 goals in their last 3 home games in Eredivisie. Groningen has under 2.5 goals in their last 3 games in Eredivisie. Ajax won their last 3 home games in Eredivisie. Groningen scored in last 6 away games in Eredivisie. Ajax scored in last 4 home games in Eredivisie. PSV Eindhoven has over 2.5 goals in their last 9 games in Eredivisie. PSV Eindhoven has over 2.5 goals in their last 3 away games in Eredivisie. ADO Den Haag has over 2.5 goals in their last 4 games in Eredivisie. PSV Eindhoven won their last 9 games in Eredivisie. PSV Eindhoven won their last 3 away games in Eredivisie. Haugesund has under 2.5 goals in their last 4 games in Eliteserien. Brann has under 2.5 goals in their last 3 games in Eliteserien. Haugesund won their last 3 home games in Eliteserien. Haugesund scored in last 4 home games in Eliteserien. Haugesund allowed opponents to score over 1.5 goals in last 4 games in Eliteserien. Sundsvall has over 2.5 goals in their last 3 games in Allsvenskan. Sundsvall has over 2.5 goals in their last 3 away games in Allsvenskan. Orebro won their last 4 games in Allsvenskan. Orebro scored in last 4 games in Allsvenskan. Sundsvall scored in last 5 away games in Allsvenskan. Ostersunds has over 2.5 goals in their last 3 games in Allsvenskan. Malmo won their last 3 games in Allsvenskan. Ostersunds lost their last 3 games in Allsvenskan. Ostersunds scored in last 4 home games in Allsvenskan. Malmo scored in last 5 games in Allsvenskan. Atlanta United has over 2.5 goals in their last 5 games in MLS. Atlanta United has over 2.5 goals in their last 3 away games in MLS. Colorado Rapids has over 2.5 goals in their last 3 home games in MLS. Colorado Rapids lost their last 3 games in MLS. Atlanta United scored in last 9 away games in MLS.